Op de site Greater Good in Action – Science-based Practices for a Meaningful Life – van de Universiteit van Californië te Berkeley, zijn simpele oefeningen te vinden om ons algehele gevoel van welbevinden te vergroten. De oefeningen zijn makkelijk te vinden op categorie (bijv. compassie, verbondenheid en optimisme), maar ook op de hoeveelheid tijd die de oefening kost en de moeilijkheidsgraad. Human nature is often portrayed as selfish and power hungry, but research by Dacher Keltner finds that we are hard-wired to be kind. Kinderen hebben het vaak te druk, net als volwassenen. Ze kunnen niet slapen, zijn snel afgeleid en onrustig. Ondertussen moeten ze ook veel: op school, in het gezin, buitenschoolse activiteiten en spelen met vriendjes en vriendinnetjes. Mindfulnesstrainer Eline Snel zag ook bij haar eigen dochter Anne dat zij zich moeilijk kon concentreren. Tijdens een gesprek met Annes lerares bleek dat onderwijzers vaak geen idee hebben hoe ze kinderen aandacht bij kunnen brengen. Teachers and administrators at Brooklyn College Academy, a New York City public school that prepares students for college study, want their meditation room to be a model for other schools across the five boroughs. Before there was a dedicated room and trained instructors, Lisa Noble started her classes with a mindfulness exercise. Noble, a social studies teacher and mindfulness practitioner who has taken Mindful Schools and MBSR [Mindfulness Based Stress Reduction] courses, said that she got into meditation as a way to deal with the physically and emotionally draining teaching profession. … Damkina Jeromey, 15, who is now in tenth grade and her second year as a meditator. “At the beginning of ninth grade I was stressed out, always worrying. School is very rigorous because [I go to an] early college high school, so I have a lot of work to do. Also, I go to an extracurricular program called Legal Outreach, and they give a lot of work, too. It was really rough for me in the beginning. Mindfulness really helped me destress and stop worrying too much.” Jeromey … said mindfulness has helped manage her migraine headaches and improve her grades and relationships with other people. Stop monster-merger BaySanto! (to: Commissioner for Competition Margrethe Vestager, European Commission) A Bayer-Monsanto merger would be a disaster for our farmers. It will be a catastrophe for our bugs, bees and birds. We urge you to reject the merger and prevent the damage caused by these corporations. We also demand full openness about your decision making processes. Why is this important? On October 16 we have published scientific research with our partners, showing the proposed merger should be forbidden under EU competition law. The research, done by international competition law experts from the University College London, explains how Bay-Santo would control our entire food system. They want farmers to buy all they need from one company. Starting with GMOs, seeds, and pesticides as their main products, Bay-Santo will also offer fertilizer, digital equipment, and farm machinery. Bayer is one of the largest producers of agricultural chemicals, fertilizers, and pesticides. And Monsanto is one of the leading producers of genetically modified plants. Together, these companies could have a total lockdown on what farmers put in their fields, the pesticides they use, what we buy in the shops, and ultimately put on our dinner tables. If the merger is to be successful, the two companies must gain approval of competition authorities all over the world, including from the EU. Bayer has managed to “convince” Donald Trump to back the mega-merger , and now there is really only one organisation that has enough clout to stop the deal – the European Union. what kind of mind are we living in? You have this country and you try to make it a pleasant place for you to live in, you grow trees and you keep it clean. And you have your homes, your rooms, which you keep clean, decorate, try to make it a pleasing environment. And we have our bodies, which we keep clean, we eat the right food, excercise and we try to make ourselves look attractive, keep healthy and fit. But the place we really live, is in our mind. And how much time and effort do we give to making our mind a pleasant place in which to dwell? To cleaning it, to opening up the windows to let some fresh air in, to decorate it beautifully, to make it a fit place to stay so that we live in our mind comfortably and we are at home in our mind, so that our mind is a friend to us. This is very important because if we don’t have a peaceful friendly mind its very hard to be peaceful and friendly to our families, in our workplace, with our neighbours and in the country and from there to the world. The kind of society we have reflects the mind of the people living in that society. So each one of us is culpable of the society we live in. Who made the rules? Who elected the politicians who made the rules? Who goes along with the rules that have been made? Each of us is responsible. We cannot just put the blame on other people, each one of us has the responsibility to develop our selves, our minds, to open up our heart. So often people feel quite helpless and hopeless: what can I do, I am just one? But each of us is not sealed in a bubble, each one of us is constantly interacting with other beings; and even on that level how much time do we spend each day trying to make each other happy? Our colleages, our family, the peolpe we meet? Are we kind? Is our speech kind? Do we make people feel better for having matters or worse? If a society is full of people who are kind to each other, all other, then that is a very different society from one where people disregard each other, where people speak rudely to each other or despise each other. It’s a cold and foggy morning in Brussels. Together with 20 other activists I have been waiting for Frans Timmermans for more than an hour. The first Vice-President of the European Commission will open the EU conference on plastic strategy today. We have 600,000 signatures from all over Europe to hand over – three kilograms of paper. Will our signatures hold any weight for him? Timmermans and his staff are coming around the corner with quick steps – and his reaction leaves us almost speechless. He is concerned about the waste of our seas: “I am your ally and I will do my best so that we can present an ambitious strategy by the end of this year”. 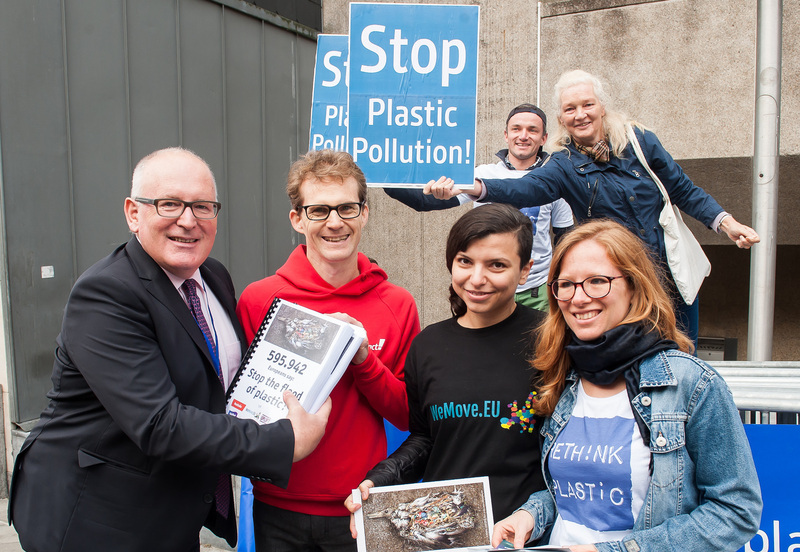 Timmermans, the second-ranking official in the European Commission supports our campaign – this is a real breakthrough! Are these just empty words? It does not look like it. In his opening speech at the conference, he mentions our petition right at the beginning – to the surprise of the plastics lobby. And shortly after, he posts a video of our delivery on Facebook and Twitter. EU’s First Vice-President takes the fight against plastic waste very seriously – and our Europe-wide campaign is of great help to him. The Atlas of Emotion was commissioned by the Dalai Lama, his purpose is “ In order to find the new world we needed a map, and in order for us to find a calm mind we need a map of our emotions”. The simple, but not easy, goal of this Atlas is to help us be aware of our emotions. Awareness of our emotions means understanding how they are triggered, what they feel like and how we respond. Awareness itself is a strategy, it helps us understand our emotion experiences. We do not want to get rid of our emotions, we want strategies that help us respond in helpful, constructive ways. ‘While the Atlas of Emotions is a large map on a computer, Eve Ekman has turned to a smaller guide that can be carried around. Her current brainchild, called EmoTrak, “is like having a little Atlas of Emotions in your pocket,” she says. The EmoTrak app asks users twice a day to report the trigger, experience and response of their most recent emotion. … In a pilot study of EmoTrak, Ekman says that even residents in specialties that have high levels of burnout find that their daily emotion tracking reveals that half of their daily emotions are still enjoyable ones. “That very simple practice of bringing awareness of our emotions has the potential to remind us that even amidst the most challenging times we have capacity for being OK,” she says. The app is currently used for research purposes, please click here for more information.